One of my favorite side dishes to fix on the fly is roasted green beans. It's a quick and flexible recipe that doesn't require much forethought other than buying the fresh green beans. It's perfect for those moments when you're thinking, Oh crap, what vegetable should I serve with that whole chicken or beef pot roast I threw in the slow cooker this morning? Or, I only have time to pan-fry a few chicken breasts or fish filets, what can I serve with it that won't take much time and effort? Roasted green beans to the rescue! Roasting fresh green beans in the oven for about 20 minutes with your favorite oil and seasonings brings out so much flavor with hardly any work. It's one of my secret methods for making almost any veggie taste better and getting picky eaters (like my long-time boyfriend) to try them. 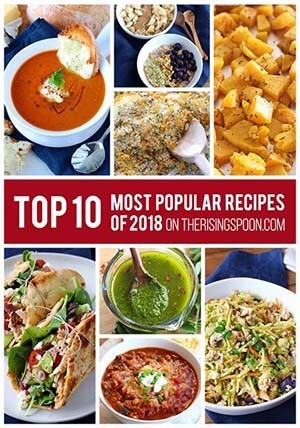 In fact, two of the most popular posts on The Rising Spoon are my balsamic oven-roasted green beans and oven-roasted green beans with coconut oil recipes! I love, love, love both of those recipes (balsamic vinegar & coconut oil are an excellent option for all kinds of diets); however, they're actually not my favorite way to season fresh green beans! 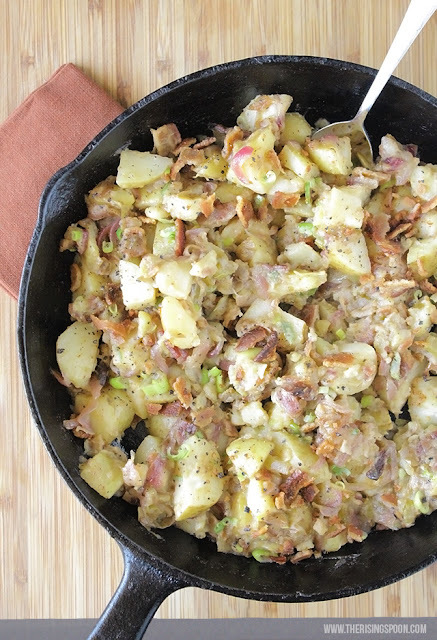 In true Midwestern fashion (meat & potatoes-style), I love my green beans with onion, garlic, and bacon! I first made green beans this way back in 2012 on the stove-top in my cast-iron skillet using The Pioneer Woman's recipe. It was super yummy but took quite a bit longer since I had to wait on the chicken stock to reduce with the lid cracked. 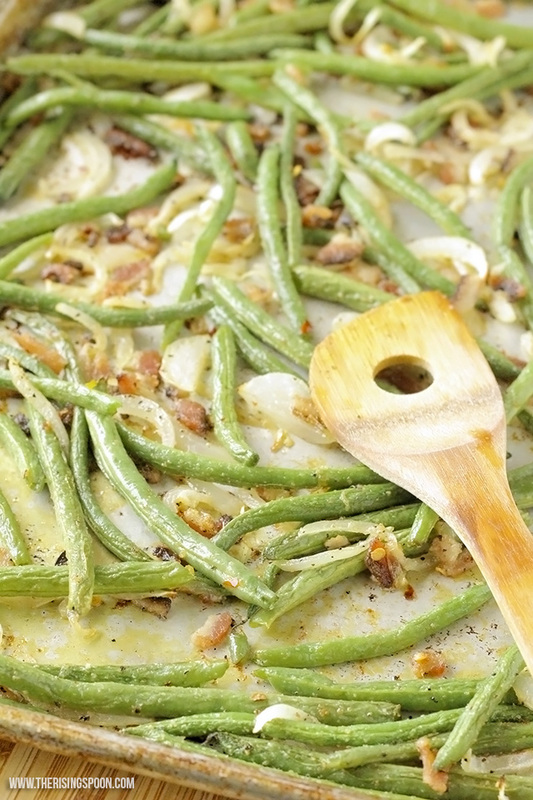 I loved the way the onion, garlic & bacon all combined to make the green beans (and final dish) taste savory, smoky, and slightly salty, but wanted a faster way to achieve this. To save myself a few minutes of prepping, I skipped the fresh minced garlic (you can still use this) and opted for dried granulated garlic instead. As you can imagine, the results are delicious! I usually end up devouring a huge pile of these roasted green beans first while the main dish sits forgotten. 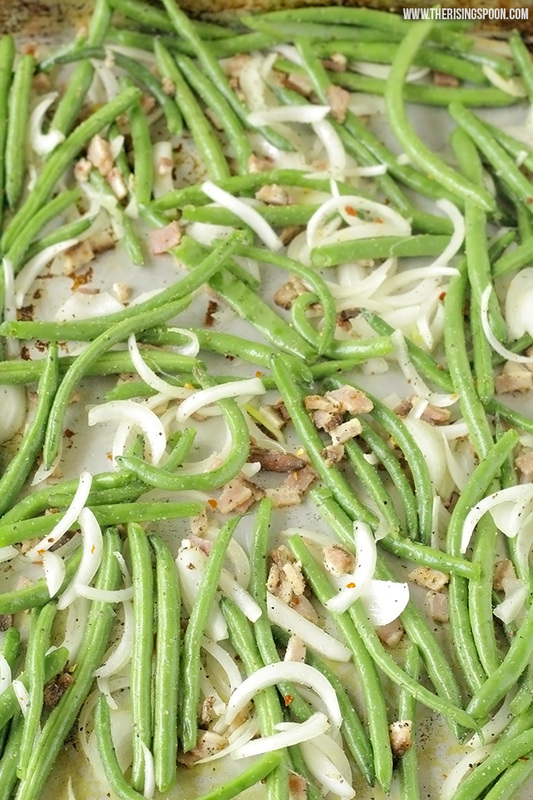 Fresh green beans tossed with thick-cut bacon, sliced onion, and simple spices, then quick-roasted in the oven til tender, slightly caramelized, and crispy around the edges. 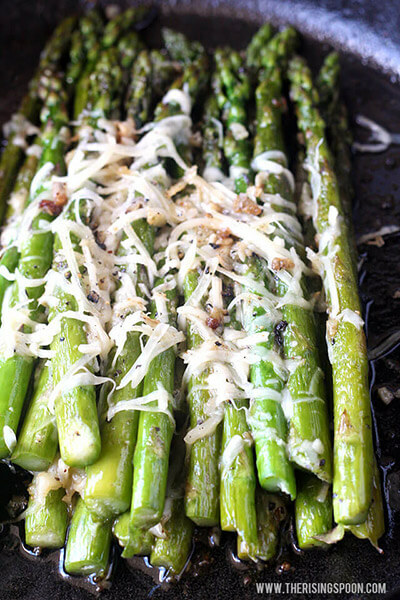 This is a quick and easy side dish recipe for any night of the week! Pre-heat the oven to 400 degrees. Rinse and thoroughly dry the green beans, then snap off the stems (if there are any). Peel and thinly slice the onion, then dice the bacon. 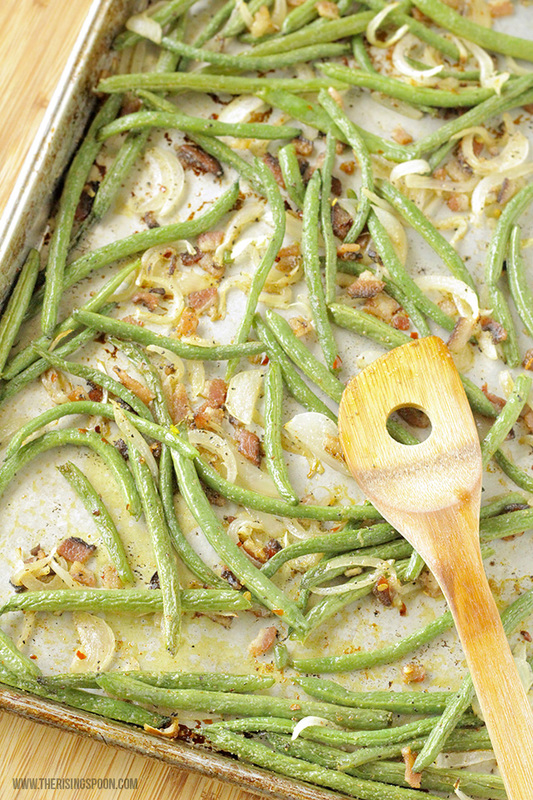 Spread the green beans, onion, and bacon across a large rimmed baking sheet and toss everything with cooking oil. Season with granulated garlic and cracked black pepper (I'm liberal with both of these) + sea salt (adjust based on the saltiness of your bacon) and crushed red pepper for a hint of heat. Lightly shake the baking sheet a few times to spread out the ingredients (this helps them cook evenly & get crispy instead of steaming) and pop in the oven. Cook for about 20 minutes, stirring once halfway through, or until the green beans are tender and the bacon is cooked through + as crispy as you desire. 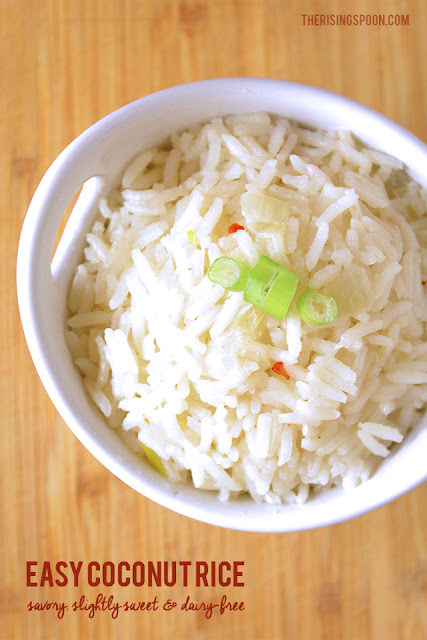 Serve immediately and store any leftovers in a container with a tightly fitted lid to eat within 2-3 days. 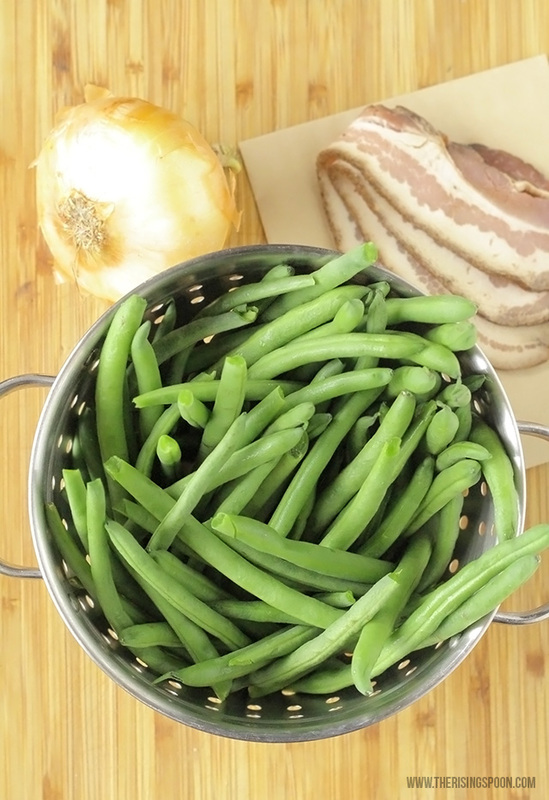 Note: If you prefer your green beans to have a crisp texture and only want to cook them for about 8-10 minutes in the oven, you'll need to cook the bacon separately on the stove-top, then crumble it over the green beans at the end. You will get less bacon flavor this way, but it will, at least, ensure everything is cooked properly. 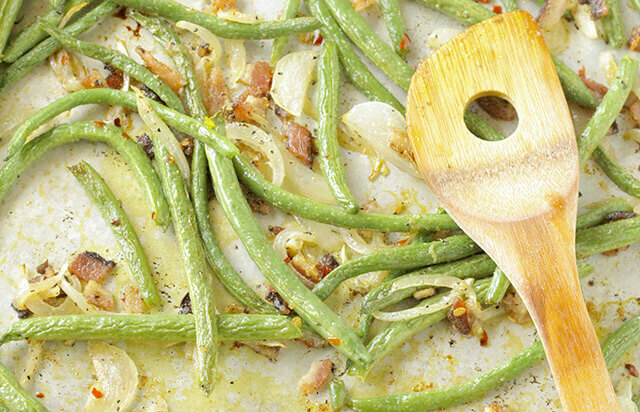 What's your favorite way to season and cook green beans? 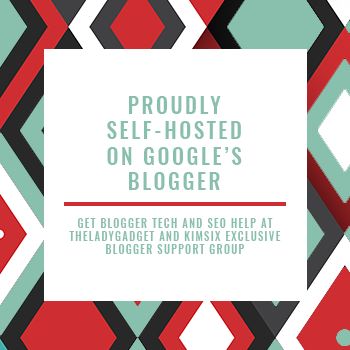 I'd love if you shared your favorite tips and ideas (it is my favorite vegetable, after all).